Huddersfield Town and Benin striker Steve Mounie says that getting a first Africa Cup of Nations victory is the main target for the Squirrels in Egypt. At their previous three finals Benin have only drawn once and lost their other eight games. Benin will face holders Cameroon, Ghana and Guinea-Bissau in Group F in Egypt. "If we get our first win, it will be historic - so first of all win a game, try to go through the groups and we'll see what happens," he told BBC Sport. "To be honest it's a tough group we have to take our chance, to do our best on the pitch and make proud our country, make the people of Benin proud." 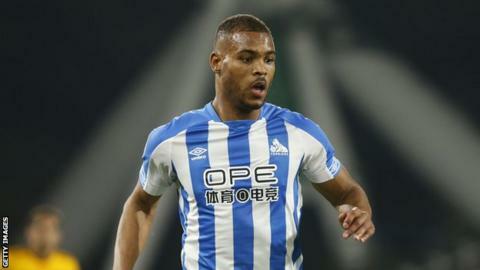 Mounie will be looking to bounce back from the disappointment of being relegated from the English Premier League with his club Huddersfield Town. "I am so excited about this. It's been a while that Benin was at the Africa Cup of Nations (2010) and we are all excited about it," he added. He admitted that at first he had wanted to be in a different group. "First of all, I wanted to be in another group because you play in Ismailia and I know that my family want to come, so I wanted to be in a group where the stadium is in Cairo near the camp," he explained. "But in the end, we were in Group F and to be honest they're only good teams in this Afcon. "If we were in another group, it would be hard as well because I have seen the other groups. "It's still hard playing in Group A against Egypt and DR Congo - then there's a group with Morocco, Ivory Coast and South Africa that's very hard as well." Mounie also says he is more than happy to stick with Benin's nickname of the Squirrels despite the federation considering trying to change it. "I think we won't change. We will stick with the Squirrels," he said. "It's not a problem to be called the Squirrels. Look, we are in Afcon and some big animals are not - so to be honest the Squirrels is very strong." Benin begin their Group F games on 25 June against Ghana before facing Guinea-Bissau four days later and finally take on Cameroon on 2 July.